Well, though the article doesn't say it, I'll be the first to come out and say what all of us on SI are thinking. I have the answer . . . This is obviously a piece from Doc Brown's Delorean. Clearly, it got left behind somehow. I have no doubt an extensive search of the area will turn up Marty's skateboard/hoverboard in short order. On a serious note, I sympathize with a critic quoted in the article - it is disappointing that this was not covered by a scholarly journal in some fashion. 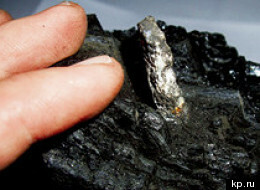 A rock dated at 300 million years old has a piece of semi-modern machinery imbedded in it? Either it is a ridiculous hoax or geological dating presuppositions are to blame. Perhaps the folks at AiG or ICR will mention this. Just like He did the dinosaur bones.